Theater Preview: Broadway Musical "Beautiful" Explores the Rise of the Groundbreaking Carole King | Theater | Style Weekly - Richmond, VA local news, arts, and events. The North American tour cast for “Beautiful: the Carole King Musical” includes Julia Knitel as Carole King, Erika Olson as Cynthia Weil, Ben Fankhauser as Barry Mann and Liam Tobin as Gerry Goffin. The four are responsible for some of the biggest hits in the American pop songbook. If you grew up in the ’70s, you know Carole King tunes. The album went to No. 1 on the Billboard charts for 15 weeks and remained on the list for much of the decade. Filled with classics such as “It’s Too Late / I Feel the Earth Move,” “So Far Away” and “You Make Me Feel (Like a Natural Woman),” it helped define a generation just as feminism was gaining a foothold, selling more than 25 million copies. The formula is simple: Tell an underdog story punctuated by sing-a-long favorites that keep audiences waiting for the next nostalgic rush. 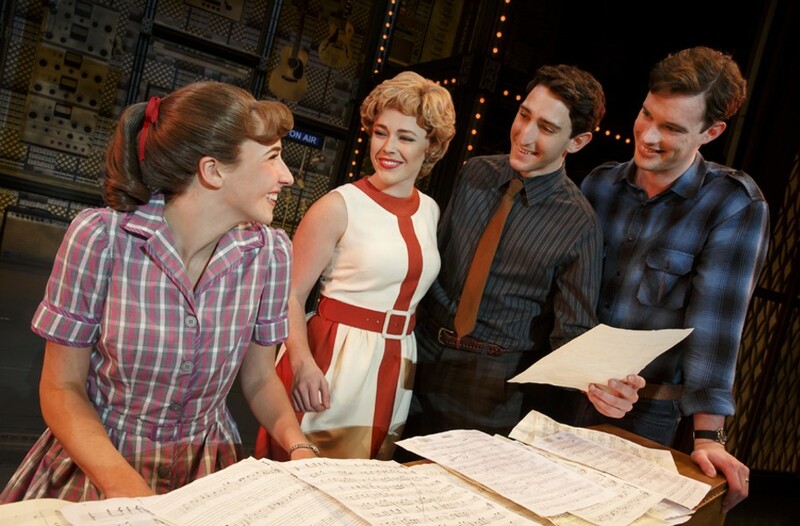 So perhaps it isn’t a surprise that “Beautiful: the Carole King Musical” has been a smash on Broadway since opening at the Stephen Sondheim Theatre in January 2014. In the touring production, Weil is played by Erika Olson, a 22-year-old in her first job since graduating from Carnegie Mellon University. The show follows King’s life from when she was 16, selling her first song to Don Kirshner in Times Square, and then writing hits for acts such as the Drifters and the Shirelles before working up the nerve to launch her own career. “They all had a beautiful, healthy competition and friendship,” Olson says, noting that the songwriting teams went on vacations together, if only to make sure that neither couple was working when the other was off. Weil and Mann are still married after 50 years together, Olson says, adding that it wasn’t difficult to flesh out the character because of the strong book and libretto. In Richmond, King will be played by Julia Knitel, an understudy of actress Jessie Mueller who received rave reviews for her complex performance on Broadway. So has Olson noticed any transformation in audience members who bring their lived-in memories of the songs? Although Olson says she’s yet to meet Weil, King came to see the show a few months ago. It might be too nerve-wracking to have Weil in the audience, she adds. Broadway in Richmond presents “Beautiful — the Carol King Musical” from April 25-30 at the Altria Theatre, with matinees Saturday and Sunday. Tickets from $43. altriatheater.com.